⬅ The Best News You Ever Had!!! 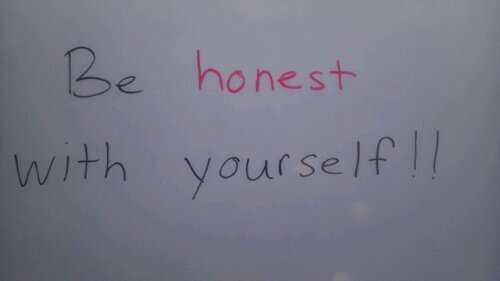 Whiteboard Quote of the Day: Be honest with yourself!! Telling the truth is not always easy. Many times telling the truth means we have to say something to somebody they do not want to hear. But what happens when that somebody is you? What happens when your reality is hurtful, embarrassing, or something you don’t want to face? After all, if we are not honest with ourselves, then how can we be honest with our spouse, our children, or our friends? How can we be honest with our business partners, co-workers, or investors? My guess is it would be mighty difficult if not altogether impossible. As I go through this week, I want to focus on just that, being honest with myself. I want to make sure I am telling myself the brutal honest truth. No exceptions. No justifying. Just truth! Maybe some of you reading this, don’t have a problem with that. But I will be honest. I sometimes do. Sometimes I judge the mistakes of other people and minimize it when I do the same. Or at best justify it. That is not being honest with myself. I get frustrated at my kids for “keeping their face in some sort of screen (TV, iPod, DS)”, yet my phone is always with me and usually it’s “in my face.” That is not being honest with myself. I get upset because my my wife calls me out about something I didn’t do, that I said I would do. Thinking “she didn’t need to say anything about that“, yet I do the same, probably more often, than she does. That is not being honest with myself. Being honest with ourselves can be difficult, but the rewards are AWESOME! Below are some ways you will benefit by being honest with yourself. When you are honest with yourself, you are free to be yourself. You become authentic, an original, you become genuine. There is no need to conform to any limitations or boxes that anyone else tries to place on you. You have removed any and all boundaries, starting with those self-imposed. This freedom makes you limitless, and there is nothing that can stop you. One of the greatest benefits of being honest with yourself is the growth that comes from it. Admitting to yourself that you have fears about something allows you to now overcome them. It can be a humbling experience, but now you know your “enemy” and can find out how to defeat it. If you don’t admit to yourself where you are today, financially, in your relationships, with your body, then you don’t know what needs fixed. Imagine going into surgery and they doctor doesn’t know what is wrong with you. Not good huh? People appreciate someone who can admit when they are wrong. I am not saying go out and broadcast to the world every time you mess up, but do admit it to yourself. But take responsibility and it will show. Others will respect that. When you can do that and you need to address something that your spouse, your kids, or your peers have done wrong, they can respect you and what you say because they see that you do the same when you make a mistake. One small lie usually doesn’t end there. Typically you have to continue to support that lie with more lies. Eventually the truth will come out. Even with yourself. You can be in denial that your finances are jacked up, until the repo man comes, your utility payment check bounces, or your child doesn’t have any money to attend school or invest in their dreams. At that point, the truth comes out. However, when you admit these things, you don’t have to won’t have to worry about somebody coming and taking your car, your lights getting cut off, or your children not having the best opportunities available for their future. There is something about “when you know that you know.” When you know something as fact, then there isn’t much that can be said or done to dissuade you. You understand what needs to be done. You don’t waver. You have a clear perspective and vision about who you are, and about what your life is about. When this happens, you are intentional in what you do, and you are more purpose driven. This is when real breakthroughs happen. That is why being honest with yourself is so very important! Why don’t you join me? Take a look at where you are in life. In your marriage, with your children, your career and peers, your finances, and your goals. Be brutally honest with yourself, and begin to take action so that those things become something that you wouldn’t mind being shared with the world. Question: When have you had to be brutally honest with yourself, and it resulted in a big breakthrough? Please share in the comment section below.